There can't be a lot of people in the world for whom the new wouldn't be powerful enough. 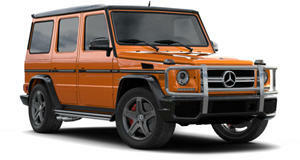 But those few can now turn to , which has released a full tuning package for the big Benz. Part of the tuner's Geneva lineup this year, the Brabus 800 Widestar amps up the 4.0-liter twin-turbo V8 to epic proportions. Where the "standard” model leaves the factory with 577 horsepower and 627 lb-ft of torque, the Widestar boasts 789 hp and 738 lb-ft. That's as much torque and much more power than the old produced. With 212 more horses and 111 lb-ft more torque, the tuner's take on the G63 will thumb its nose at the laws of aerodynamics and propel its considerable heft to 62 in just 4.1 seconds – down from 4.5 stock and the discontinued G65's 5.3 – and top out at an electronically limited 149 mph. Of course Brabus hasn't just massaged the engine. As the name suggests, it also fitted a wide-body kit to give it four inches of extra fender, housing massive 23-inch forged alloys. It even redesigned the front end for added cooling and a carbon-fiber hood with twin power-bulges. The brightwork's all been painted to match the body color, and the interior's been completely reupholstered in two-tone tan and black diamond-quilted leather, with a Rolls-style "starry sky” headliner that embeds fiber optics into Alcantara. So the Brabus 800 Widestar makes us forget all about not only the G65, but the as well – at least until the ultra-luxe division comes out with its own version of the new G-Wagen, and maybe – just maybe – reintroduce the V12 under the hood, too. And just imagine what Brabus would do with that.